Nope, you've GOT to be kidding! 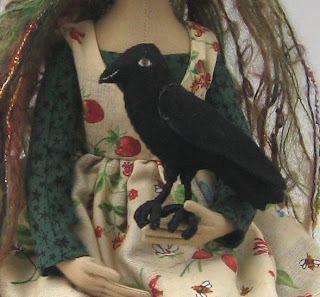 I love your new doll - love the crow. I had two gigantic ravens outside my house all morning - making all kinds of noise. They were HUGE! Sorry to tag you, didn't know you weren't a fan, but it's fun to read about people! She is wonderful! I love that she has her own crow. Sometimes when I'm going through a self-critical slump, I go back to making quick little pieces. That helps me work back up to other things. Fairiesnest I can completely relate to your creative slump at the moment, but I must say I am continually awed by your beautiful work! And Lizbeth and Dante? Superb! Lizbeth and Dante are fabulous! She looks like she should be heading off to Hogwarts in the fall. Summer here IS the pitts, I feel your pain, and ditto on the winter clothes. I love a thick nummy sweater, *sniff* Im going to miss them terribly. Oh she is really something special! Of course I think all of your dolls are, but I do understand going through slumps! 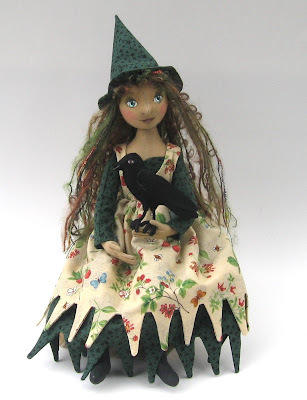 The crow is a wonderful companion for her, I love it when pieces speak so clearly to you! your work is amazing! she is beautiful! Such a beautiful doll! I love your blog, it always makes me smile and the new banner pic really makes me feel all springlike. Oh! This is my doll! Mine! Everybody else just back the hell away - she's mine! if Mickey Armstrong hadn't insisted I go to the bathroom with her right in the middle of a highly dramatic scene; made me get out of the secure sanctity of my theatre seat, dragged me up the aisle, still watching the film, I would NEVER have screamed when Barnabas Collins bit Caroline's neck. I do understand that it made an otherwise ho-hum vampire movie far more exciting!! !